A ea. pc. 1/2-9/16 x 7 1/2 x 19"
B ea. pc. 1/2-9/16 x 7 1/2 x 19"
C ea. pc. 3/8 x 7 7/16 x 20 1/16"
ea. pc. 3/8 x 7 x 23"
ea. pc. 3/16 x 8 3/8 x 22"
A ea. pc. 3/8 x 7 x 20"
B ea. pc. 3/8 x 7 x 20"
A ea. pc. 1/4-5/16 x 7 1/16 x 22"
B ea. pc. 1/4 x 7 1/16 x 22 1/4"
A ea. pc. 3/16-1/4 x 7 1/8 x 22 1/4"
B ea. pc. 1/4-5/16 x 7 x 22 1/8"
A ea. pc. 1 7/16 x 3 1/2 x 28 3/8"
B ea. pc. 1 1/4 x 3 3/16 x 29 7/8"
C ea. pc. 1 5/16 x 4 x 30 1/8"
D ea. pc. 1 7/16 x 4 x 30 1/8"
ea. pc. 1/4 x 7 x 20 3/16"
A ea. pc. 5/16 x 7 1/8 x 20 1/4"
B ea. pc. 5/16 x 7 x 20 3/16"
A ea. pc. 5/16 x 5-7 1/8 x 20 1/4"
ea. pc. 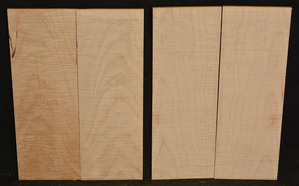 5/8 x 7 1/16 x 22 1/4"
A ea. pc. 3/16 x 9 x 22 1/2"
B ea. pc. 3/16 x 9 x 22 1/2"
A ea. pc. 3/8 x 7 5/8 x 21 15/16"
B ea. pc. 5/16-3/8 x 8 x 23 9/16"
A ea. pc. 5/16-3/8 x 7 1/8 x 20 3/16"
B ea. pc. 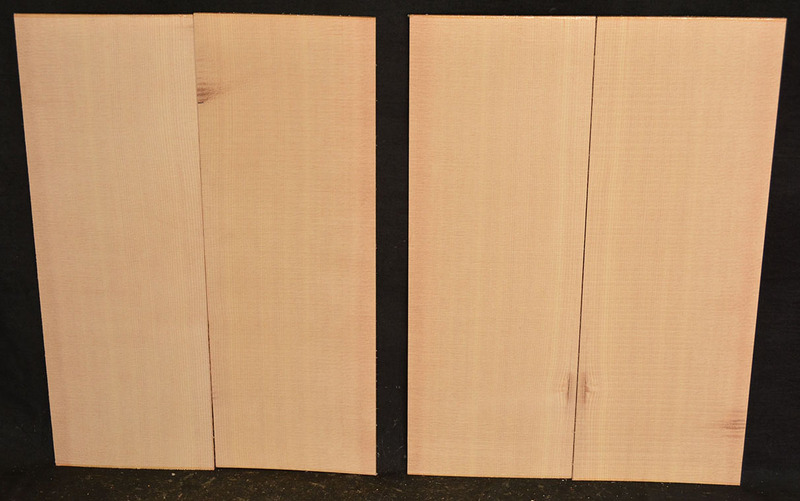 7/16-1/2 x 7 3/16 x 20 1/16"
Also called Ovangkol and Amazakoue. 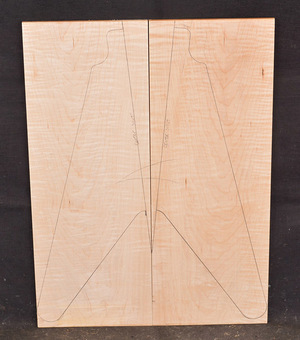 This wood is increasingly becoming popular as an acoustic guitar wood. The color varies from a rich, golden brown to a lustrous grayish brown usually with a black stripe. ea. pc. 3/8 x 6 3/4 x 18 3/8"
A ea. pc. 3/16-1/4 x 7 15/16 x 19 1/2"
B ea. pc. 3/16- x 7 7/16 x 22 5/8"
A ea. pc. 3/16 x 8 x 22 11/16"
B ea. pc. 3/16 x 7 15/16 x 22 9/16"
A ea. pc. 3/16 x 7 15/16 x 22 9/16"
B ea. pc. 3/16 x 7 15/16 x 22 5/8"
A ea. pc. 5/16 x 7 x 19 15/16"
B ea. pc. 5/16-3/8 x 8 x 21 3/8"
ea. pc. 5/16-3/8 x 7 x 21"
A ea. pc. 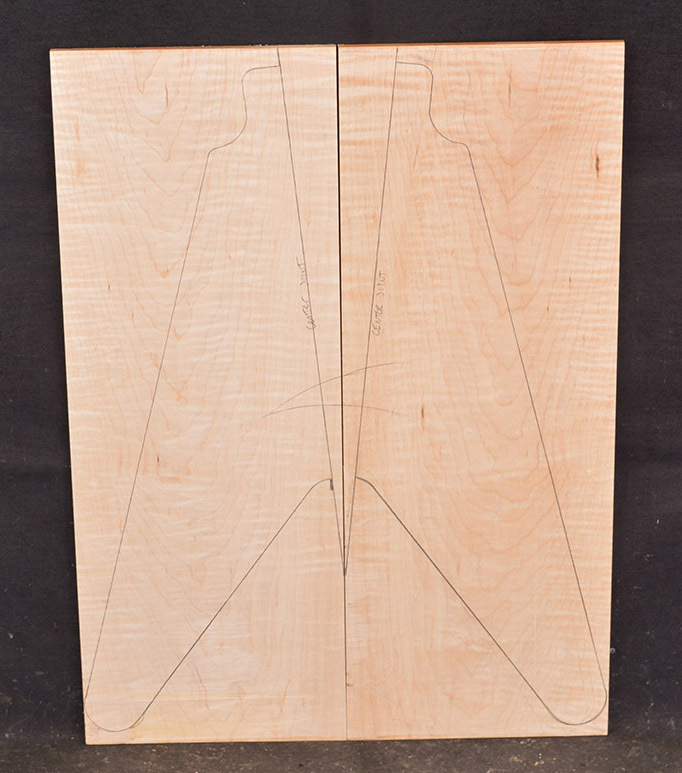 3/8 x 7 1/16 x 22 1/8"
B ea. pc. 5/16-3/8 x 7 x 22 1/16"
A ea. pc. 1/4-5/16 x 6 15/16 x 24"
B ea. pc. 1/4-5/16 x 6 15/16 x 25"
ea. pc. 1 11/16 x 2 3/4 x 30"
This West African wood is sometimes sold in the U.S.A. as African Cherry. The dust can be irritating to the nose-wear a suitable respirator. A ea. pc. 5/16-3/8 x 7 1/2 x 22 11/16"
B ea. pc. 5/16-3/8 x 7 1/2 x 22 7/8"
ea. pc. 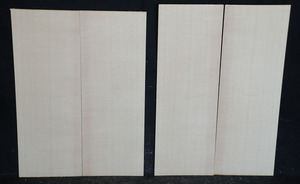 5/16-3/8 x 7 x 20 5/8"
A ea. pc. 7/16-1/2 x 6 5/8 x 20"
B ea. pc. 3/8 x 6 1/2 x 23 3/8"
ea. pc. 5/16 x 7 1/4 x 19 13/16"
A ea. pc. 5/16 x 6 3/4 x 19 7/8"
B ea. pc. 5/16-3/8 x 7 x 20 1/4"
A ea. pc. 13/16 x 3 1/8 x 30 3/16"
B ea. pc. 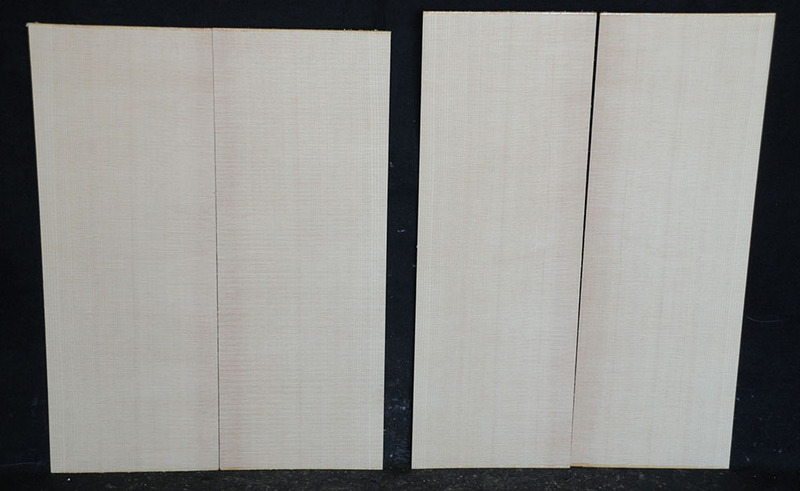 15/16 x 2 5/8 x 48 1/8"
The heartwood is white or cream to light brown or reddish brown. Hard and heavy, 45 lbs/cu ft. Easy to work and takes a smooth polish. U.S.A.
ea. pc. 1 3/4 x 3 5/16 x 30 1/16"
A ea. pc. 5/16 x 7 1/8 x 19 1/4"
B ea. pc. 3/16 x 7 1/16 x 22 1/8"
A ea. pc. 5/16 x 7 x 20 1/8"
B ea. pc. 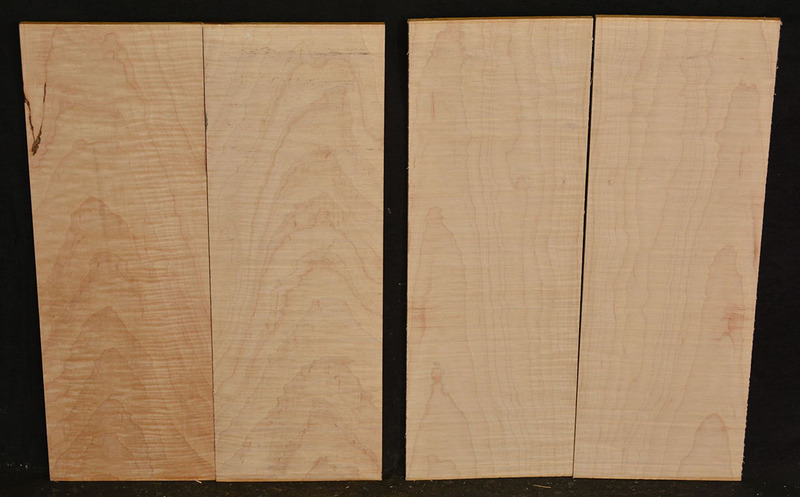 5/16 x 7 x 20"
Also called English or European Sycamore. Has a color similar to vanilla ice cream. The beautiful fiddleback figure is accentuated by a lovely fleck on the quartersawn surface. Kiln-dried. ea. pc. 5/13 x 6 7/8 x 20 1/8"
A ea. pc. 5/16-3/8 x 7 1/16 x 20 1/16"
B ea. pc. 5/16-3/8 x 7 1/16 x 20 1/16"
ea. pc. 3/8-7/16 x 7 x 18 1/2"
A ea. pc. 1/8-3/16 x 7 3/4 x 22 3/16"
B ea. pc. 1/8-3/16 x 7 3/4 x 22 7/16"
A ea. pc. 3/8 x 7 x 22 5/16"
B ea. pc. 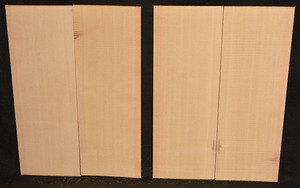 5/16-3/8 x 7 1/2 x 24 1/8"
ea. pc. 5/16-3/8 x 8 1/2 x 23"
B ea. pc. 3/8 x 7 x 20 1/8"
A ea. pc. 3/16 x 8 x 23"
B ea. pc. 3/16 x 8 x 23"
A ea. pc. 1/8-3/16 x 8 1/16 x 21 13/16"
B ea. pc. 1/8-3/16 x 7 15/16 x 22 11/16"
A each piece 3/8 x 7 13/16 x 22 1/8"
B each piece 3/8 x 7 3/4 x 22 1/8"